The Best Indian Food blogs from thousands of top Indian Food blogs in our index using search and social metrics. Data will be refreshed once a week. You may also like our global Food Recipe blogs list.Also check out Top Indian Food Youtube Channels list for Top videos on Indian Food. Indian Food newsletter is a comprehensive summary of the day's most important blog posts and news articles from the best Indian Food websites on the web, and delivered to your email inbox each morning. To subscribe, simply provide us with your email address. India About Blog Nisha Madhulika makes vegetarian Indian recipes that are easy to cook and good to eat. Facebook fans 531,188. Twitter followers 1,838. India About Blog A destination for tried and tested recipe videos from India and around the world. Facebook fans 5,462,265. Twitter followers 2,224,820. Bangalore About Blog Archana's Kitchen is India's leading recipe and food discovery platform that gives the world a credible and confident 'DIY' solutions for everyday cooking. Its mission is to encourage people to enjoy cooking with simple recipes, with focus on health and nutrition. Facebook fans 1,588,824. Twitter followers 11,564. Facebook fans 1,979,673. Twitter followers 2,650. Facebook fans 699,873. Twitter followers 4,820. Facebook fans 1,088,324. Twitter followers 982. India About Blog I am on a mission to show you how easy cooking can be. I share recipes with easy step by step pictures which clearly clearly shows you the ease of cooking. I will be giving ideas for your daily cooking by sharing breakfast, lunch & dinner ideas..
Facebook fans 1,042,420. Twitter followers 1,980. Seattle,wa About Blog Richa Hingle is the prolific and award winning recipe developer, blogger, and photographer behind VeganRicha. Her instructions are easy to follow and her step-by-step photographs welcome the uninitiated into their kitchen. She loves to show people how easy it is to cook vegan Indian or other cuisines. Her first cookbook Vegan Richa’s Indian Kitchen, about easy and delicious Indian Vegan recipes. Facebook fans 867,405. Twitter followers 8,798. Singapore About Blog Jeyashri's Kitchen is vegetarian food blog with over 1000 plus recipes with detailed step wise instructions. This website has a good collection of South Indian, North Indian and international recipes and also includes Eggless baking recipes too. Facebook fans 387,024. Twitter followers 251. Mumbai, India About Blog Easy Indian vegetarian recipe videos by India's most trusted brand name, Tarla Dalal. There are over 170 cookery books written by Tarla Dalal and she is one of India's best selling cookery author. Visit her website www.tarladalal.com which has 17,000 plus recipes and is the largest Indian food site. Facebook fans 369,264. Twitter followers 107,392. Coimbatore About Blog A website with many south indian and north indian recipes, baking recipes and few international recipes....all recipes include stepwise pictures which makes it easy even for beginners to cook.Hope you enjoy your time here! Facebook fans 335,097. Twitter followers 2,473. Bangalore About Blog A Collection of Tamil Nadu Recipes, Tamil Cuisine, Kongunad Recipes. Easy Vegetarian and Non Vegetarian dishes with step by step pictures. Facebook fans 445,919. Twitter followers 1,011. Chennai, India About Blog Subbu's Kitchen is an Indian Vegetarian Kitchen which has a collection of traditional as well as modern day Indian recipes which are presented in easy step by step pictures which can help even a beginner to cook like a pro. Facebook fans 537,452. Twitter followers 279. Washington, D.C. About Blog A food blog with easy and tasty vegan meals for the family, made with fresh, healthy ingredients. More than 800 vegan recipes and Indian recipes for cooking and baking. Facebook fans 14,362. Twitter followers 1,454. India About Blog Easy to cook Indian Vegetarian Recipes-South Indian, North Indian dishes,Tamil Brahmin recipes with step by step cooking instructions and pictures. Facebook fans 33,912. Twitter followers 1,403. Helsinki, Finland About Blog My name is Anupama Paliwal, and I welcome you to My Ginger Garlic Kitchen, an Indian Fusion Food Blog, where I share my recipes, food styling tips, and how to’s. Here, you will discover exemplary video tutorials and recipes of Indian and western food with spices and herbs. Facebook fans 105,094. Twitter followers 819. Facebook fans 173,799. Twitter followers 1,204. About Blog A food blog all about healthy, simple and innovative new recipes. Collection of world cuisines featuring everything from baking to cooking basics, home organization and cooking tips. Facebook fans 23,762. Twitter followers 2,218. India About Blog Indian Food blog with Indian Vegetarian Recipes, Indian Non Veg Recipes, South Indian Recipes and Indian regional cuisine. Facebook fans 294,071. Twitter followers 83. London, ON About Blog A step-by-step visual guide to effortless cooking. Thas presents simple and healthy recipes along with traditional recipes from her family. Facebook fans 104,943. Twitter followers 1,439. Goa, India About Blog MasalaHerb.com is a blog, initiated by Helene D’Souza in 2011. This includes Food section, Recipes with a focus on Goan Food as well as Asian/Indian food. Facebook fans 6,037. Twitter followers 8,388. California, USA About Blog Welcome to my Flavorful Fusion Kitchen. Find Authentic Indian recipes with a lighter version, Fusion of Spices and World Cuisine. Facebook fans 14,052. Twitter followers 6,673. United States About Blog A gourmet dictionary of over 750 simple recipes ranging from breakfast, kids recipes, vegan, non-vegetarian to Kerala dishes to make cooking fun. Facebook fans 139,470. Twitter followers 38. Bangalore, India About Blog Welcome to my blog, where I simplify healthy eating for you. Easy and quick, with a reasonably short list of easily available ingredients, these are the kind of recipes you’ll find on my blog. I also share with you my thoughts on nutrition, healthy eating and mindfulness. I hope my blog helps you in a small way to eat and live healthier. Facebook fans 23,792. Twitter followers 45,048. Singapore About Blog Started in April 2007, Edible Garden has now grown to become an online resource on recipes, mainly for Indian food, eggless cakes, paneer recipes, and other easy to make, good food. Facebook fans 216,183. Twitter followers 3,421. About Blog This is an online recipe guide with simple cooking instructions and pictures for each of the steps to making Indian vegetarian and vegan food. Bring out the chef in you while making any of our recipes with precise and easy "How to's". Facebook fans 244,319. Twitter followers 842. London, Ontario, Canada About Blog A vegetarian cook for many years, Lisa shares her collection of delicious and healthy recipes at foodandspice.blogspot.com, with an emphasis on spicy Indian dishes. Facebook fans 6,170. Twitter followers 846. Facebook fans 48,002. Twitter followers 44. Madrid, Spain About Blog A website with many traditional South Indian and North Indian recipes for everyday cooking. You will also find some eggless baking recipes for beginners. Lots of recipes with photographs! Facebook fans 226,015. Twitter followers 1,344. Roorkee About Blog Shalini a food, travel, lifestyle blogger and a restaurant reviewer writes about her culinary experiences. Facebook fans 529. Twitter followers 3,231. Carmel,In. About Blog I am Anto. I am an IT professional turned into a full-time blogger. I create delicious Indian recipes to inspire others to cook. Being a mom I focus more on kids friendly food. Facebook fans 510,992. Twitter followers 168. New Jersey, US About Blog This blog is my recipe journal(mostly Andhra recipes) where I write about the new (and old) recipes that I have tried in my kitchen. Most of the dishes here are Indian, focusing more on South Indian cuisine. Facebook fans 4,998. Twitter followers 981. Texas, USA About Blog I am Swathi who loves to explore cuisines from all over the world. Whenever possible I try to to give an Indian touch to several of the world cuisine. Facebook fans 20,044. Twitter followers 3,814. USA About Blog A vegetarian food blog with unique and interesting recipes from all over the world mainly focused on South Indian Cuisine. From traditional, authentic recipes to fusion and eggless bakes, you can find it all in Vidhya's vegetarian kitchen. Facebook fans 29,663. Twitter followers 1. India. About Blog Every day Indian and Kerala recipes along with some baking recipes and international recipes with step by step pictures. Facebook fans 26,062. Twitter followers 747. Seattle, WA About Blog Manju a food blogger and recipe developer making real food with real ingredients with a touch of spice. So pretty much what she make in her kitchen, that is Indian, is a curry of some kind, even if it is not called so. Facebook fans 19,217. Twitter followers 3,562. Facebook fans 8,032. Twitter followers 3,186. Facebook fans 53,012. Twitter followers 2,820. Bangalore About Blog Food-travel blog featuring traditional Indian recipes, with global flavours. We write about history behind the recipe or food, the modern trends in food. Facebook fans 2,837. Twitter followers 524. India About Blog A space to focus on Indian Vegetarian, Kid friendly dishes, Indian Traditional Dishes and not the least, Indian Diet for fitness and weight loss. Facebook fans 162. Twitter followers 1,851. United States About Blog An Indian food blog with quick easy vegetarian recipes from north Indian cuisine to south Indian cuisine and just about everything in between. Facebook fans 49,188. Twitter followers 25. India About Blog Phenomenal World is the blog by Pravin Menon on the best of life experiences, food,beverages, recipes, adventure, product reviews, automobile reviews, book reviews, travel, haiku and photography. Facebook fans 1,021. Twitter followers 24. Thane, India About Blog Welcome to my blog. I am a passionate food blogger, Recipe Creator , Food Stylist and Food Photographer . Love to cook and keep trying my hands on different dishes in kitchen. Facebook fans 6,742. Twitter followers 1,377. Facebook fans 14,962. Twitter followers 1,347. Bengaluru, Karnataka About Blog One stop shop for all easy & simple tested recipes! Facebook fans 13,100. Twitter followers 106. Orlando, FL About Blog Cookilicious is a food blog focusing on easy-to-make vegetarian/vegan meals.Through recipe development & drool-worthy pictures, you get a peek into my kitchen. Facebook fans 9,275. Twitter followers 1,048. Bengaluru, India About Blog Phenomenal World is the blog by Pravin Menon on the best of life experiences, food,beverages, recipes, adventure, product reviews, automobile reviews, book reviews, travel, haiku and photography. Also search google by Phenomenal tastes. Facebook fans 990. Twitter followers 24. About Blog Nitha Kitchen covers traditional and fusion Indian/International recipes. Most of them are healthy with step by step pictures and explanations. Facebook fans 7,655. Twitter followers 657. Facebook fans 17,682. Twitter followers 1,187. India About Blog Indian vegetarian recipes food blog with collection of easy and quick South Indian and North Indian recipes along with egg recipes..
Facebook fans 4,043. Twitter followers 2,419. India About Blog India's leading travel, lifestyle and restaurant review website committed to share enriching content. Find restaurant reviews of the major restaurants in Delhi, Gurgaon, Noida & NCR. Facebook fans 12,784. Twitter followers 3,452. Facebook fans 17,336. Twitter followers 10,969. About Blog Curry Nation is a food blog by Priya. This website is all about food. Recipes shared here are tried and tasted. Facebook fans 15,029. Twitter followers 672. Mumbai, India About Blog Authentic Vegetarian Cuisine authored by Vinaya Prabhu. Facebook fans 969. Twitter followers 4. Kochi, India About Blog When I started this blog my focus was an attempt to collect, put together and share the recipes from our traditional Palakkad Iyer cuisine. All the recipes on this blog have been tried out in my kitchen and largely reflect our preferences. Facebook fans 2,556. Twitter followers 1,956. India About Blog This blog is a collection of good food and fond memories that remind me of my mum's home cooked food, those that transport me to distant moments of childhood or shared happy times with loved ones, friends and family. Facebook fans 5,737. Twitter followers 167. About Blog Keep up with articles and recipes from Food Tasted. Facebook fans 940. Twitter followers n/a. Facebook fans 9,705. Twitter followers 187. Cambridge, UK About Blog Welcome to Give Me Some Spice. It features Authentic Traditional Indian Vegetarian Recipes with step-by-step instructions by Mina Joshi. Her blog features quick and easy time saving recipes. Her mission is to share her authentic recipes. Facebook fans 8,973. Twitter followers 1,498. About Blog Easy life for Everyone Is a food Blog. This blog is about Easy healthy Recipes from all over the world. And ‘DIY’ solutions for everyday cooking Spice mixes. Indian recipes for The ketogenic diet. I Will Share tried and tested all popular vegetarian recipes from India. About Blog Start documenting your kitchen stories with us right now to inspire, and be inspired by food lovers. Start a Food Blog for Free! RecipeBlog is your one-stop-shop for all your food blogging needs. From amazing templates to inbuilt analytics and monetization, you will have everything you need to start sharing your passion about food. Facebook fans 775. Twitter followers n/a. USA About Blog A vegetarian blog with healthy South Indian and North Indian recipes, low calorie sweets and desserts, all explained with step by step pictures. Facebook fans 30,508. Twitter followers 692. Bengaluru About Blog Shobana P Rao Cooking Enthusiast & Food Blogger, sharing a collection of Indian recipes, some cooking tips and useful hints. Facebook fans 16,539. Twitter followers 215. Bengaluru, India About Blog A tamilian food blog by Deepa, exploring different varieties of food with all the recipes she have tried out in her kitchen. Facebook fans 18,901. Twitter followers 1,191. Bangalore About Blog A blog to share my passion for cooking and creating something to delight others..
Facebook fans 1,740. Twitter followers 347. New York, NY About Blog Everyday recipes to entice your taste buds. From authentic Indian cuisines to global experimental food. Facebook fans 14,060. Twitter followers 1,642. Hyderabad, India About Blog The goal of Hyderabad Ruchulu is to shed some light on Hyderabadi Recipes, for those who always want to find out what makes Hyderabadi Food so unique. Facebook fans 6,362. Twitter followers 21. Greater Noida, India About Blog Browse our collection of easy recipes, healthy recipes, meal and food recipes which can make you more hungry and healthy with its healthy ingredients and easy instructions. Facebook fans 92,321. Twitter followers 28. Abu Dhabi About Blog A food blog with recipes of breakfast, main course, desserts, cakes, kababs, curries, snacks and juices. Facebook fans 235,095. Twitter followers 327. About Blog A blog about the food of Assam, India. The uniqueness and methods of cooking by Assamese people. Facebook fans 4,007. Twitter followers 448. Facebook fans 1,598. Twitter followers 1,160. About Blog I am Samira, a homemaker, whose hobby is to learn and explore. I am passionate about cooking and just love to experiment and try out anything and everything that is vegetarian and eggless. Through this blog, I want to share the treasures of my journey with home cooks like me. Hope you adorn my treasures to the extent of trying out in your kitchen for your loved ones. Facebook fans 3,634. Twitter followers n/a. Mumbai, India About Blog Food Mazaa is a one stop blend of many cuisines. Come let's have fun with the art of scrumptious cooking, the tantalizing sense of taste and the wonderful world of aromatic flavours . Facebook fans 23,442. Twitter followers 500. United Arab Emirates About Blog This blog is about different types of Indian and continental cuisines. Facebook fans 25,536. Twitter followers 1. About Blog I am a lawyer by profession but it is my passion to cook and experiment with different tastes and cuisines. I started with simple day to day recipes and realised how much I loved to cook. Follow this blog where you can find my recipes. Facebook fans 462. Twitter followers 46. Kolkata About Blog A food blog with delicious Indian vegetarian dessert and appetizer recipes In Hindi and English. Make this to create a lifetime of cherished memories! Munich About Blog The Magic Saucepan is a visual fete featuring healthy and seasonal dishes, mostly focusing on the authentic, traditional vegetarian food from the Indian subcontinent. Facebook fans 24,904. Twitter followers 730.
mumbai About Blog Indian Food Express is the brain-child of Geetha Sridhar, of Master Chef Fame -Season 4. Yes, didn’t want to restrict the thoughts to few south indian recipes as well I believe that even sky isn’t the limit. Cooking is a passion or simply a thing that bonds me together and Indian Food Express makes that possible. Facebook fans 637. Twitter followers 3,335. About Blog Eat More Art is an award winning vegetarian food blog an ambrosia celebrating love, beauty, and wholesomeness on a platter. Through my passion, creativity, and art that I express here on this blog, I intend to positively touch and inspire the lives of many around the world, by encouraging them to cook/eat more artfully and with love, and have a positive impact on their mind, body, and soul. Facebook fans 1,131. Twitter followers 108. Wisconsin, USA About Blog Breaking Naan is about breaking bread with friends to share and discover experiences and recipes from our travels around the world. We trace our roots to India and Naan is one of the popular breads of our cuisine. Hence the name “Breaking Naan”. We are about food, sharing and discovery. Facebook fans 2,961. Twitter followers 24. Bengaluru, India About Blog The journey of Jolly is something for the books. Jolly started in a small store in Binondo as a homegrown brand with a simple vision behind it, and that is to provide as many homes with a range of top quality products. Are you looking for simple recipes which are easy, tasty and most importantly user friendly? Then this is the right place for you. All recipes are tried and tested! Facebook fans 8,159. Twitter followers 2,434. India About Blog A blog about the Gastronomical Journey by Rohit Dassani. He is an avid food blogger, photographer and traveler from Bangalore. He started blogging in the beginning of 2009 with the idea to share his personal experiences. Now in 2016 he is rated among the top food blogger in Bangalore who love’s to write about restaurant/food reviews, travel escapade and day-today experiences. Facebook fans 1,598. Twitter followers 175. About Blog Vanita's Corner is all about simple recipes, gardening tips and home remedies. Facebook fans 5,309. Twitter followers 10. Thane, India About Blog I would like to blog about my journey with food. How it all started and how I became a, as my hubby puts it, great cook. As I am a Maharashtrian, my focus would be on sharing the delicacies of the state along with their importance and facts about the ingredients. I will try and make healthy recipes, keeping in mind today's changing lifestyle and the requirement to eat healthy. I will also try and share the health benefits of each of my recipe along with some simple and interesting tips. Facebook fans 194. Twitter followers 40. About Blog Veg.Food & Recipes. Welcome to my world of vegetarian recipes. Who knows, your might find some recipes that will inspire you. Facebook fans 110. Twitter followers 36. Basel, Switzerland About Blog No complicated #cooking in my kitchen! Simple,fuss-free dishes made with love & a dash of spice! blogger on how to cook Indianfood & Use spices with ease! Facebook fans 626. Twitter followers 291. Singapore About Blog A food blog with recipe videos on delicious vegetarian recipes from Indian as well as world cuisine, which are super easy to follow and prepare. Facebook fans 13,139. Twitter followers 142. Facebook fans 3,490. Twitter followers 452. About Blog Keep up with Indian Food Recipes from Flavours Of Life. Brazil About Blog A food blog with south indian vegetarian & non vegetarian recipes like,rice varieties,curries,gravies,paratha,desserts,sweets,snacks, juices, cakes and more. Facebook fans 26,295. Twitter followers n/a. Bangalore and Sydney About Blog Chitra Amma's Kitchen is a blog that provides delicious,traditional, vegetarian, South Indian Recipes. There are few 'World Recipes' as well! Facebook fans 3,476. Twitter followers 44. Nairobi, Kenya About Blog My passion for cooking has brought me until this part of life to start a blog and share the recipes to all. Hyderabad, India About Blog Hello everyone!! I am Ekta Agarwal from Hyderabad, India. I am foodie and I love to try new things, learn about things related to food. Instead of focussing the recipes, I focus more on informative, fact based, content and research based articles related to food. I have recently started reviewing restaurants too. Hope you enjoy learning and reading about different aspects of food world. Facebook fans 5,221. Twitter followers 13. Kanata, Ontario, Canada About Blog Welcome to my world of cooking at Mama’s Secret Recipes where you can get inspired to cook and enjoy food. Born in a large family in India where each state revels for its cooking tradition, I developed a taste for good food from a very early age. Being creative in the kitchen and cooking new dishes to feed my family and friends is what I love doing and nothing pleases me more than seeing them enjoy what I make for them. Facebook fans 3,640. Twitter followers 60. New Delhi, India About Blog The Chatori Diaries is a Food Blog consisting of food reviews, stories, experiences, adventures and recipes of India. Facebook fans 618. Twitter followers 36. USA About Blog A blog on sweet spicy tasty food recipes. Facebook fans 678. Twitter followers n/a. India About Blog Sharmila loves everything traditional and cooks with the minimal of ingredients and time. Facebook fans 2,049. Twitter followers n/a. Facebook fans 347. Twitter followers 32. About Blog An Indian food blog with Vegetarian Non-Vegetarian food recipes with step by step for easy cooking. Facebook fans 2,455. Twitter followers 5. India About Blog We are here to share our experiences regarding food & travel across the globe. With a desire to cover every nook and corner of this earth, Gastronomically Yours is our new labour of love in the blogosphere. We are passionate about travelling the world, exploring and experiencing new cuisines, restaurants, recipes; and most importantly sharing them with everyone. Facebook fans 939. Twitter followers n/a. India About Blog Easy to Follow Vegetarian Recipes. Facebook fans 5,643. Twitter followers n/a. Bengaluru, India About Blog I'm Jyo from Bengaluru,India. I love dabbling with ideas for my blog, ranging from a well-tested recipe , experiment with dishes that tickle my palette, which turns out to be a delight on my family table. Being a working professional also calls out for keeping my cooking simple. Facebook fans n/a. Twitter followers 1,310. About Blog Simple vegetarian, nutritious and tasty home style recipes. California About Blog So How Did An Italian Start Cooking Indian? Well, I've been cooking Indian food for 20 years. I'm always learning and love to share my knowledge and love of Indian cooking with others. Facebook fans 1,335. Twitter followers 3,246. Bangalore, India About Blog Authentic Recipes of Colonial Anglo-Indian Cuisine. Lip smacking recipes of popular and traditional Anglo-Indian Food. Old forgotten dishes now revived to suit present day tastes and palates. Facebook fans 6,567. Twitter followers 284. India About Blog I'm supriya who is much passionate about cooking and tasting all kinds of vegetarian food. As my husband, my parents and in laws eat non veg I cook for them. I started this blog to share my recipes and as well as to get some tips and new recipes from the reader's too. So reader kindly share your tips and the different recipes you know. Kolkata About Blog This blog consists of easy and simple national and international recipes. Facebook fans 388. Twitter followers 3. Hyderabad About Blog A blog about simple and easy Indian recipes, Traditional Andhra recipes, Home remedies and International recipes. About Blog A Food recipe blog. About Blog Welcome to SmiShri's Carpe Diem Spicy Eats! Experience the quick and easy way to spice up your life with delicious Indian Vegetarian Cooking ...Simply Enjoy Maadi!! Facebook fans 2,647. Twitter followers n/a. About Blog This blog learns and make recipes mouthwatering appetizers, curries, Quick & easy pahadi recipes, desserts and much more focus on easy recipes made with fresh, seasonal ingredients. India About Blog Foody Shoody is a place where you can learn to make Indian vegetarian recipes very easily. Facebook fans 19,038. Twitter followers 4. 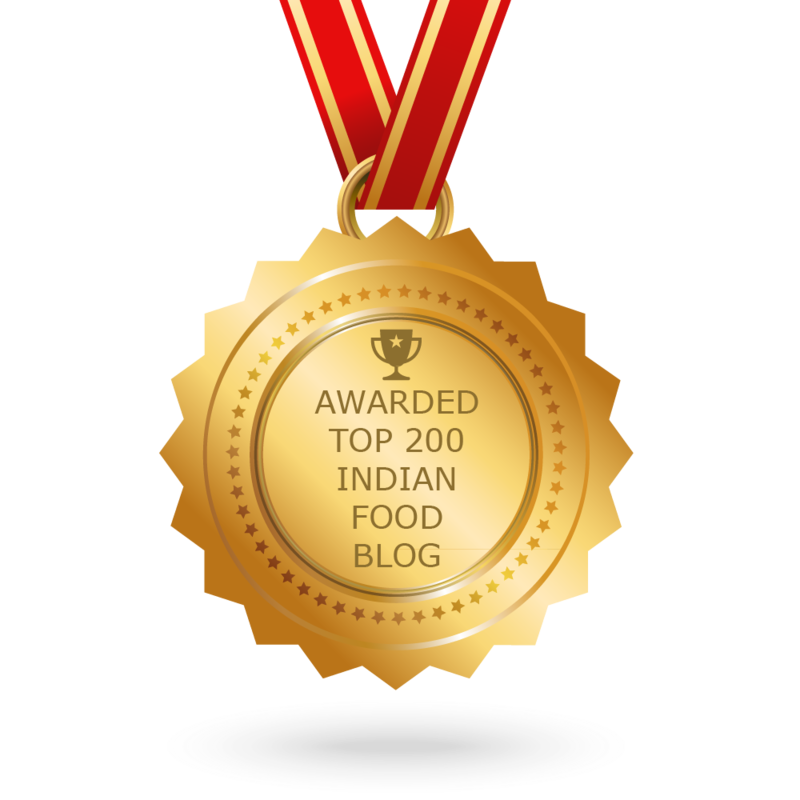 CONGRATULATIONS to every blogger that has made this Top Indian Food Blogs list! This is the most comprehensive list of best Indian Food blogs on the internet and I’m honoured to have you as part of this! I personally give you a high-five and want to thank you for your contribution to this world.